Phnom Penh has a cosmopolitan culinary scene as shown by its plethora of fantastic restaurants. 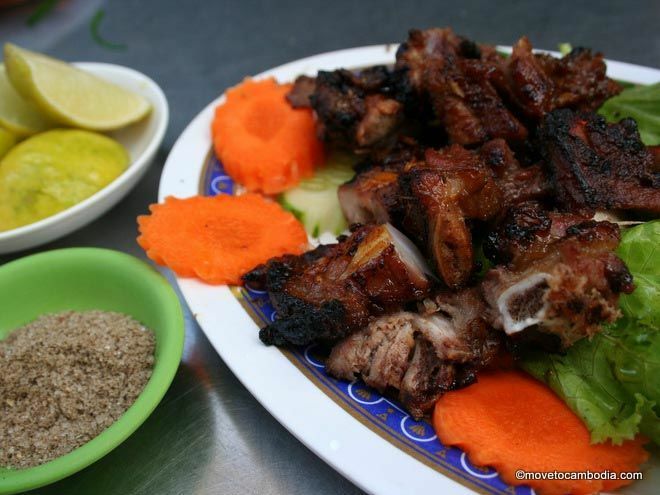 Definitely one of Phnom Penh’s culinary bright spots, 54 Langeach Sros is a local Khmer-style barbeque and beer garden that serves a mean plate of ribs — tangy with a hint of sweetness and slightly spicy. Don’t bother ordering just one plate. The ribs can take a half-hour to arrive, but they’re always worth it. Goat with black ants, “fried fish on the fire lake” (a complicated dish that involves a whole deep-fried fish cooked at the table in a pool of coconut curry), and crab with young green pepper are all excellent and remarkably affordable. 54 Langeach Sros serves a mean plate of Khmer pork ribs. When you arrive, know what type of beer you want to drink, because you’ll be inundated with friendly requests from female representatives of the various beer companies trying to persuade you to drink their brew all night. Local options are sold by the can or pitcher and imported brands by the bottle. On weekends there’s often a live cover band. It’s worth a visit to get the full Cambodian experience. Located above Pharmacie de la Gare near Vattanac Tower, after climbing a few flights of stairs, guests find themselves in a wooden interior evocative of mid-1800s Battambang. The menu, however, seems more influenced by the food of the Lower Mekong, where Cambodia’s east meets Vietnam’s south: lots of fish soups and curries, crunchy vegetables, and tart and fermented flavors. La’Baab’s fish amok is perfectly balanced, the curry’s palm sugar sweetness offset by the slight bitterness of the noni leaves, a defining ingredient that is regularly omitted in the Kingdom’s more tourist-oriented restaurants. Another standout is the mam, a dish more popular in Cambodian homes than restaurants. Milder than prahok, here braised mam was served with fatty pork belly, adding an extra rich layer to the sweet, fermented fish. Sovanna Restaurant has something to offer just about everyone. They have a newer, more upscale restaurant a few doors down, and have recently renovated the original. Even though Sovanna has lost the dirty-beer-garden feel it once had, the food is still excellent. The grilled beef and pork, tender, smoky and slightly sweet, are the standouts, but the sngor chrouk trey, fish soup with a lemongrass broth, lime juice, and fresh herbs, is not to be missed. Their menu has photographs and English translations, making this a good first Khmer BBQ experience for out-of-town visitors. 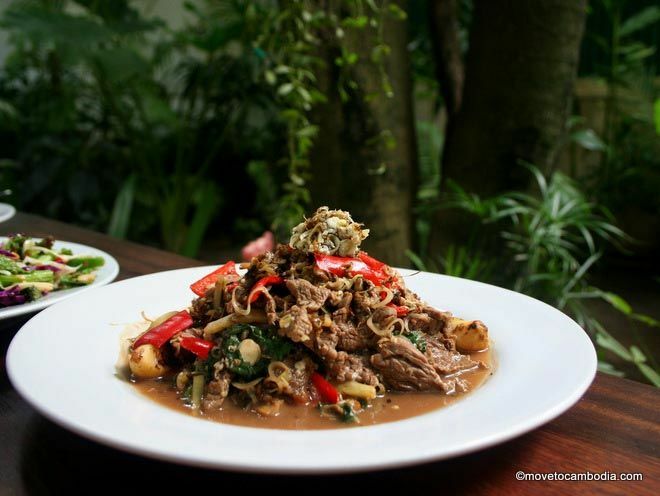 Open daily, 4 p.m. to 11 p.m.
Romdeng specializes in traditional and modern Khmer dishes, like this plate of beef and red ants. If you’re only in town for a few days and want to try the best of Cambodian cuisine, head to Romdeng. 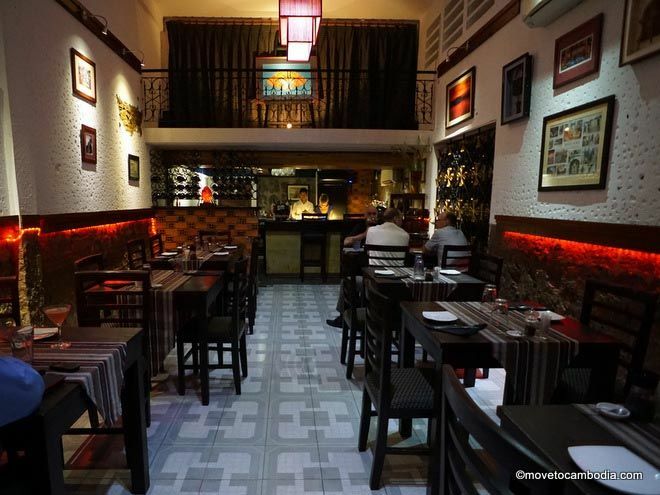 Located in a beautifully restored French colonial building, the restaurant serves traditional Khmer dishes, modern Cambodian cuisine, and even a few “creepy-crawly” dishes, such as deep-fried tarantulas and stir-fried red ants. Be warned that if you order the tarantula dish they’ll bring a live tarantula to your table to freak you out. The menu also features several vegetarian options and salads, so there’s something for everyone. The cocktails are not to be missed; they’re creative and addictive. Romdeng is part of the Mith Samlanh “Friends” organization that helps train street kids and at-risk youth to work in the hospitality industry. So pat yourself on the back for eating there, and don’t be afraid to tip. If you can’t decide whether you’re in the mood for traditional Khmer or Western food, Tummy Filler Cafe in Toul Tom Pong offers the best of both worlds. Their menu boasts Asian soups, fried rice, noodles, and Khmer classics like lok lak and amok. But it also serves up Western salads, sandwiches, pasta dishes and fish & chips. 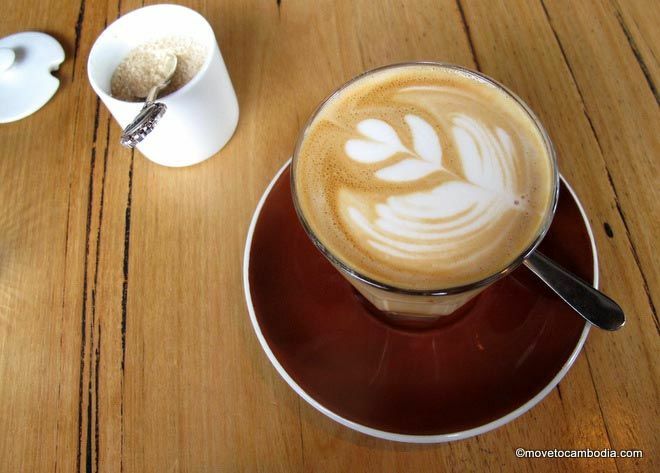 Tummy Filler opens early every day with a range of breakfast foods and specialty coffee drinks. Their bar menu includes wine, beer, and mixed drinks with a selection of unique fruity and frozen cocktails. On Street 136 between Monivong and Central Market there are a row of unassuming Chinese restaurants, all serving hand-pulled noodles and homemade dumplings. If you’re craving Chinese food or need a carb infusion, this is the street to head to. Our favorite of the bunch is Herk Fung, but it doesn’t matter which one you choose — they’re all pretty good. Read our full review of the Chinese restaurants on Street 136. Another upscale Cantonese restaurant, Emperors of China has a full menu of reasonably priced dim sum. The dim sum menu is so good, in fact, that I’ve tried very little else on their menu, although I have heard it is good. My favorites are the “carrot cake,” actually small radish cakes with X.O. sauce, prawn shui maitopped with tiny orange flying fish roe, and har gow, steamed shrimp dumplings with a chewy rice wrapper. Although it’s a lovely restaurant, the service at Emperors at China can be mediocre, because allegedly they only hire leggy models with no waitressing experience, which can make for a frustrating, if good looking, experience. Open daily, 7 a.m. to 2 p.m. and 6 p.m. to 10 p.m.
A spin-off restaurant of Emperors of China, Dim Sum Emperors is a more casual restaurant that serves primarily dim sum. The menu features 19 types of dim sum as well as inexpensive rice and noodle bowls. My favorite dim sum here are the crab meat and coriander dumplings and xiao long bao, also known as soup dumplings, and steamed pork ribs with black bean sauce. The service at Dim Sum Emperors is infuriating, just like at their sister restaurant. 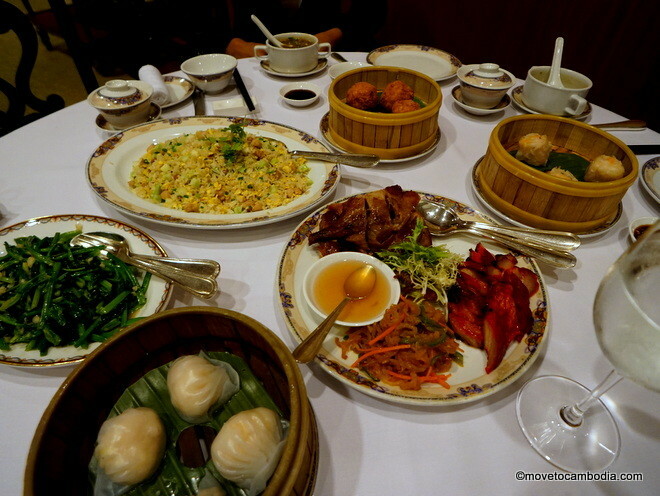 We’ve got a full review of Dim Sum Emperors on the blog if you want to know more. Treat yourself to a Chinese feast at Xiang Palace at the InterContinental Hotel. Xiang Palace is the upscale Chinese restaurant at the swish Great Duke (formerly InterContinental) Phnom Penh. They serve refined Cantonese fare, including a wide selection of dim sum (yum cha for you Cantonese speakers). The menu is authentic according to my Cantonese-speaking friend that I dragged along to try the dim sum. On a more recent visit, we loved the Chinese roasted duck and sweet char siu pork belly. They’re having a Chinese New Year special menu for the entire month of February with delicacies such as Yoshihama abalone and scallops with X.O. sauce (a personal favorite of mine), plus their regular menu of dim sum, Cantonese specialties, and specialty Chinese teas. If you’re looking for a high-end Chinese New Year meal, this is the place to go. Open daily, 6:30 a.m. to 10.30 p.m.
Expat favorite Chinese Noodle Restaurant is known for their cheap, hand-pulled noodles and homemade dumplings. This is one of those places that is often referred to as a “little-known secret” but is actually very widely known and you’ll always see at least a few English teachers enjoying their delicious fare at ridiculously low prices — a bowl of noodles can be had for less than $2. One of their specialties is Shanghai-style nian gao, also known as Chinese New Year’s cake. The dish consists of slices of chewy rice cakes, stir-fried with wilted lettuce and shiitake mushrooms in an addictive savory sauce. If you’re looking for an inexpensive way to celebrate Chinese New Year, at $2 this dish is the way to do it. At Sichuan Impression they serve up an array of authentic Chinese Sichuan dishes and hotpots. Everything is delicious, from cold sesame chicken, to the wood ear mushroom salad, to the small bowls of spicy dan dan noodles, to dumplings doused in chili oil, to the piece de resistance, a whole fish with pickled chili peppers, lotus root, and wood ear mushrooms, all smothered in garlic, spring onions, and Sichuan peppercorns, and then steamed at the table in paper. Main dishes cost between $12 and $15, and side orders were between $1 and $4. It’s not the cheapest Chinese food in Phnom Penh, but it is worth the price. Read the full review here. Known for roasting the best coffee in the Kingdom, Feel Good also has two coffee shops in Phnom Penh. In addition to serving a tasty cup of brew, they also have very good breakfasts and lunches. The menus are slightly different at the two locations–you might as well try them both–but we’re fond of the toasted bagel with cream cheese and smoked salmon that’s available at both shops, as well as the excellent huevos ranchero at Feel Good II. For lunch there’s a selection of tasty salads and sandwiches. They’ve also got free WiFi, making it a good place to get hopped up on caffeine and get some work done. Open daily, 7:30 a.m. to 3 p.m.
Get latte’ed out of it in Phnom Penh. Probably the most popular coffee chain in Phnom Penh, Brown Coffee has a dozen outlets all over town. This Cambodian coffee chain was one of the first to serve espresso-based coffee drinks, and their iced coffees and frappes are delicious. A place to see-and-be-seen for students, Brown Coffee boast plenty of big tables for work and meetings, but if you are looking for quiet, you had better go elsewhere. Their roastery on Street 57 also offers some single origin filter coffees and cold brew — be sure to specify when you order if you want yours without sugar. Open daily, 6:30 a.m. to 9:00 p.m.
For more places to drink coffee in Phnom Penh, see our guide to Phnom Penh coffeeshops. The Providore is a new deli with attached cafe that serves up simple dishes meant to highlight the imported gourmet ingredients and coffee available at the deli. The breakfasts, from eggs and chorizo to chocolate French toast with maple-infused mascarpone get good reviews, as do their lunch sandwiches. But the standout on the menu are the platters, priced at just $10. There are French, Spanish, and Italian platters, each featuring charcuterie, cheese, and accompaniments from their respective countries — the Spanish one is excellent and very good value. Finish it off with a glass of draft Stella or a bottle of wine from their extensive collection. Long-running Irina Russian Restaurant has always deserved more attention than it has gotten. The surprising culinary diversity of the region is seen on the extensive Irina menu, which features both classic Russian and Ukrainian dishes, but also specialties from the former Soviet states, including Georgia and Uzbekistan. Vegetarians will be happy to hear that the menu also offers an extensive array of vegetarian dishes. Dishes are all reasonably priced between $4 and $7, and they also sell frozen homemade dumplings by the kilo as well as their homemade sour cream and cottage cheese for takeaway. Although Irina’s offers a delivery menu, it’s worth visiting the restaurant to see the collection of Russian and Soviet tchochkes and memorabilia. Read our full review of Irina Russian Restaurant. The Lost Room is a Tonle Bassac hideaway that’s perfect for a lovely meal or a quiet drink. Open for dinner and drinks only, the Lost Room is located in the previously obscure warren of streets in the now trendy Tonle Bassac neighborhood. The cozy but stylish restaurant still has the off-the-beaten-track feel that inspired its name, and the owner and hostess, Wendy, lends the place a touch of glamour. The menu features a range of small plates that are meant for sharing, such as warm spiced goat-and-feta-cheese dip with crudites and peri peri Kampot crab cakes with onion jam. Be sure to try the crispy pork belly braised in dark ale; it will test your ability to stick to the sharing ethos. The restaurant also has a excellent selection of creative cocktails and an excellent wine list. The bar stays open late, so even if you can’t make it for dinner, The Lost Room is a great place to stop for a drink. Quitapenas is a high-end Spanish Mediterranean restaurant and tapas bar. Using local and imported ingredients (including Spanish jamon iberico), they serve up a delicious range of creative and classic tapas dishes. It’s a bit pricey by Cambodian standards, with the tariff for tapas ranging from $6 to $30, so be prepared to spend between $25 to $40 per person if you’re drinking wine. You’ll want to drink wine, of course, because they’ve got an extensive wine list, including Portuguese and Chilean wines and a good Spanish rioja. With the high prices, though, comes consistency, and the menu is reliably good. Ask for recommendations from chef Joaquin. If you want paella, it’s worth calling ahead so you don’t have to wait for it. They’re open for dinner daily, but also have an excellent brunch on weekends. Open daily, 5 p.m. to midnight, plus Saturdays and Sundays 11:30 a.m. until 14:30 p.m. If you’re only in Phnom Penh for a day or two, make sure that the Friends restaurant is one of your stops. The restaurant seamlessly blends Cambodian cuisine with modern European fare, with something to suit everyone. They’ve got a tapas-style menu that’s perfect for sharing, with meat and seafood dishes but also an extensive list of vegetarian options. The menu changes frequently, but favorites include sauteed baby squid with Kampot pepper and rice wine and a smoky eggplant, garlic, and coriander dip served with bread. Friends also serves a mean glass of fruit: they have a nice selection of refreshing freezes, shakes, lassis, and juices. Friends is part of the Mith Samlanh “Friends” organization that helps train homeless and at-risk youth to work in the hospitality industry. Order an extra dessert — it’s for a good cause. They’ve also got a store next door with some very cool hand-made, recycled souvenirs, and their cookbook, while expensive, is very good. Backyard Cafe offers live, raw, vegan, and gluten-free fare (although not necessarily all at once). Backyard Cafe is representative of the new wave of Phnom Penh restaurants. It serves live, raw, vegan, gluten-free, and healthy foods (not necessarily all at once, though). Even if this is not usually the sort of fare you find appealing, you’ll be surprised at how delicious and filling the cafe’s food is, despite the healthiness factor. The menu is filled with salads, quinoa, sandwiches, and lasagna made without pasta (it’s surprisingly good). After lunch, try a raw dessert made with cashew and nut “cheese” or one of the smoothies or juices. Backyard Cafe can also provide multi-day raw food and juice cleanses, including delivery to your home or work. Open daily, 7:30 a.m. to 4:30 p.m.
Banh Mi & Bros was started by a group of French expats inspired by the banh mi sandwich’s popularity in Paris. With brushed concrete, traditional Cambodian tiles, and a slick-looking bar, the restaurant is a far cry from the usual street stall where the sandwiches are typically sold in Cambodia. They serve eight sandwich variations, priced between $2.80 and $3.80. The ‘Special Brothers’ sandwich is a riff on the classic banh mi, made with Vietnamese pork sausage roll, ham, and pâté. It’s not cheap by banh mi standards, but it’s delicious. Touches like homemade mayonnaise and perfectly crunchy (and not sweet!) baguette make clear that this is far too gourmet to be street food. Nömpang’s Russian Market-area cafe is popular with young Cambodians because the price is right; a classic banh mi is just $1.95. And yes, it is a banh mi. They’ve hedged a bit on the name, calling the cafe Nömpang but advertising their offerings as “the best banh mi in Phnom Penh.” Nömpang’s east-meets-west sandwiches don’t have a lot of gourmet touches — they are essentially the same sandwiches you’ll find being sold out of street carts, only made hygienically and with higher-quality ingredients. Nömpang’s classic banh mi has a light layer of pâté, thin slices of pork sauce roll and ham, spring onions, cilantro, and a side of lightly pickled radish, carrot, and cucumber that you can choose to add to your sandwich. (other locations can be found on their website). Black Bambu, a restaurant run by the Cambodian Children’s Fund, is a high-end restaurant offering gourmet fusion dining and excellent brunches. The breakfast menu is small and changes regularly, with a range of brunchy options for around $4. We were impressed with their dinner menu as well, which features everything from tacos to grilled scallops, all plated beautifully. The restaurant is very brightly lit, so perhaps not the best place for a romantic first date. Open Tuesday through Sunday, 8:30 a.m. to 11 p.m.
Enso on Street 240 has a range of international influences on their menu — shakshuka and watermelon salad with pomegranates and rose water pointing to the Middle East, avocado “smash” on sourdough evidencing an Australian influence, pancakes for the Americans, and leek pie with smoked salmon and eggs benedict with leg ham to round things (and bellies) out in continental fashion. They also offer a slew of nice juices and smoothies served in mason jars. Salmon House is an amazing find for salmon lovers on a budget. The restaurant is run by a salmon importer who wanted to showcase the versatility and deliciousness of salmon. They have a $2.50 lunch menu that includes several types of salmon served with rice, and access to the all-you-can eat salad bar. There’s a more elaborate two-course $5.90 lunch option that changes daily. The ala carte menu is more expensive but still good value; a large plate of salmon sashimi is $5, and a platter of three types smoked salmon is $7 (although it’s served without bread or crackers). The preparation is clearly aimed at a Cambodian audience, and some Westerners may be offended by decisions like pairing smoked salmon with a honey mustard sauce, but whatever they are doing seems to be working, because every day the place is packed. Want to try Cambodian street food, but worried about sanitation or unsure how to ask about ingredients? Mr. Mab 123 aims to make Khmer street food more accessible to expats and travelers. Mr. Mab 123’s menu is an ode to street food around the world. In addition to highlighting classic Khmer street foods, it offers European and Asian street favorites. The drink menu includes a wide selection of beers, cocktails, and rum and whiskey flights.This is Mr. Mab’s second Phnom Penh location, the original being a crab market. Open Monday to Saturday, 11 a.m. to 11 p.m.
Big Board in Toul Tom Pong serves up an Asian twist on the classic Austrian schnitzel. Their expansive menu includes chicken, pork, or eggplant schnitzel with various preparation, sides, and sauce options to customize your meal. Noodle dishes, fried rice, and appetizers are also available. 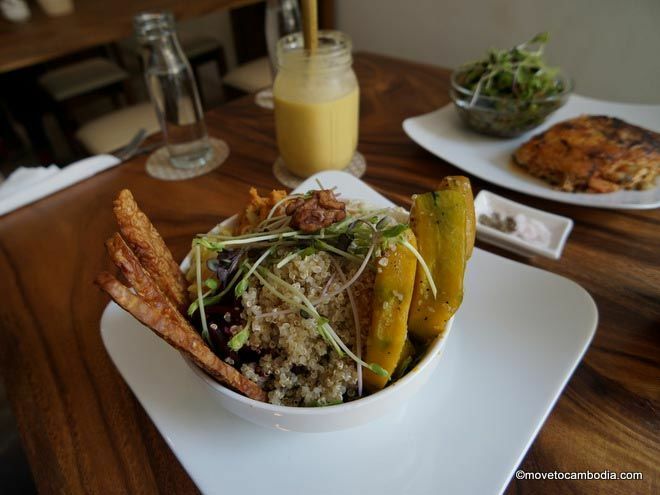 There are many vegetarian choices including eggplant schnitzel, noodle and rice dishes, deep fried vegetables, and deep fried tofu crumble balls. Big Board also has a selection of wine, beer, and drinks including homemade lemonade. Open Monday to Saturday, 11 a.m. to 3 p.m., 5 p.m. to 10 p.m. Yes, it’s in the Lonely Planet guide, but this oddly named Keralan restaurant serves up lively, chili-infused southern Indian food — curries and thalis, with quite a bit of seafood — plus beer, lassis, and south Indian and Malaysian-style teas to boot. Try the Kadala curry, made with black chickpeas and studded with black mustard seed and curry leaf, and sop it up with well-made Keralan-style roti, a flaky fried bread. Or come in for breakfast and treat yourself to a terrific dosa — a crisp, crepe-like pancake made from a lightly fermented rice and lentil batter. Dosas come either rolled or folded around your choice of filling, a masala mixture of fragrant potatoes, onions, and spices and rich ghee, or a couple of fried eggs. The dosas are accompanied by sambal and coconut and tomato dipping sauces. The back room is air-conditioned, but we enjoyed sitting in the front and observing the neighborhood goings-on. 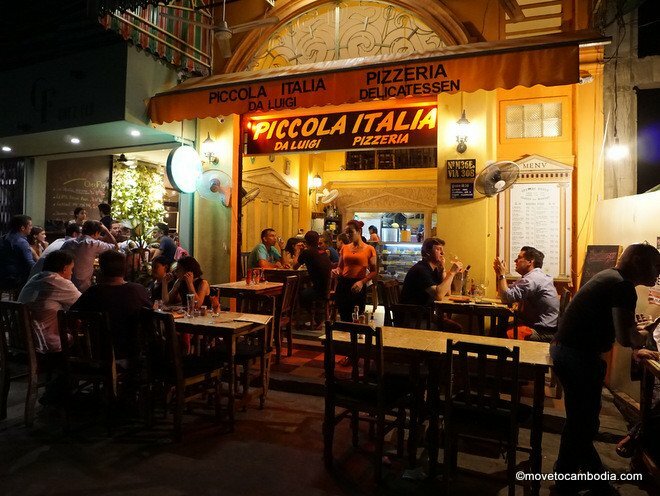 Piccola Italia is a popular pizzeria among Phnom Penh expats. The small restaurant in Tonle Bassac is always packed, because they serve the most authentic Italian pizza in Phnom Penh. Their pizzas are crispy, and thin-crust with bulbous air pockets around the rim, that holds its shape when lifted. If you’re a pizza aficionado, you’ll want to try Piccola. Arriving when theY open is the best way to get a seat at Piccola. They are packed most nights! Brooklyn Pizza and Bistro serves thick-crust American-style pizzas. They’re large and substantial, drenched in cheesy, meaty goodness. A pizza here can easily make for a meal for three or four. You’ll also find burgers, cheesecakes, and a variety of beers including German and Belgian beers, and local craft beers from Cerevisia Craft Brewhouse at Brooklyn Pizza. The Italian House is a quiet, cosy restaurant specializing in Neapolitan-style pizzas. What’s that, you say? Neapolitan-style pizzas are thin crust and bake at higher temperatures and and only cook in about 30 to 90 seconds in a domed brick oven. Other specifications for certified Neapolitan pizzas include using a specific type of Italian tomatoes for the sauce, using a specific type of Italian flour for the crust. The restaurant is run by Mr. Paolo, an Italian pizza maker and oven builder. The pizza at Italian House are, without a doubt, authentic and delicious. Open daily, 5 p.m. to 10 p.m.
Japanese Noodle Bar O-San serves up several types of ramen and tsukemen ramen — the latter is cold noodles served with an intense porky gravy for dipping that is sort of ramen deconstructed, and perfect for hot days. The specialty of the place is tonkotsu ramen, that features a rich, milky pork bone broth that is the specialty of Kyushu in Japan where the chef hails from. We tried the special tonkotsu which could have been billed “heart attack in a bowl” — it was an enormous portion of the previously mentioned tsukemen pork gravy that is most certainly best enjoyed in small quantities. The small restaurant is casual but authentic and popular with Japanese expats. The service can be spotty, but if you’re a ramen fan it’s definitely worth a visit. Kanji: some of the best sushi in Phnom Penh. Kanji Japanese Restaurant is Cambodian celebrity chef Luu Meng’s latest venture. As with his other restaurants (Malis, Topaz, and Yi-Sang), the culinary delights at Topaz don’t come cheap. The restaurant is definitely on the upscale side, perfect for impressing a business associate or romantic partner. Kanji’s menu is quite extensive, covering the gamut from sashimi to soup and teriyaki to teppanyaki. It’s expensive by Cambodian standards, but not ridiculous when compared to similar establishments elsewhere in the world. Prices range from $9 for tempura or $11 for salmon teriyaki to $28 for makunouchi bento or $14, $22, or $30 for a sushi moriawase combination. 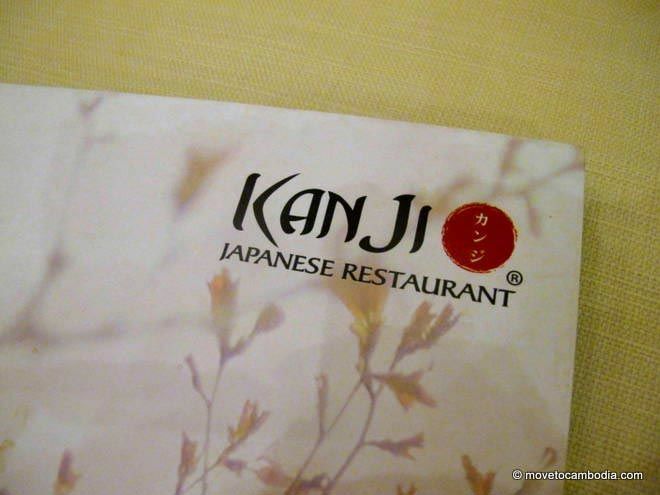 Read our full review of Kanji on the blog. Open daily, 11:30 to 2:30 p.m. and 5:30 p.m. to 10:30 p.m. This undeniably popular eatery has gotten people from outside of the neighborhood into Toul Tom Pong for the first time in a long time. Russian Market is to Phnom Penh what “above 14th Street” is to the Village-dwellers of New York City–a place that’s regarded as not worth going to. But Sesame Noodle Bar changed all of that with their tiny menu of perfectly crafted meals. The stars of the menu are the sesame house noodle ($3.75) and the sesame fatty noodle ($4.50). The house noodle can also be made vegetarian or vegan, with tofu and vegetable noodles in place of egg noodles. The dishes feature chewy cold noodles with crisp cucumbers, lettuce and tomatoes, a hard-boiled egg, and caramelized pork (for the house noodle) or pork belly (for the fatty noodle) with a cold sesame sauce. It’s simple and delicious food. The other stand-out on the menu is the thor bun (2 for $2.25)–roasted pork belly on a steamed bun with homemade pickles and hoisin sauce and a touch of sriracha. Momofuko’s got nothing on this. And on top of that, the place is cute, filled with Japanese toys and action figures. In the evenings they also serve creative cocktails. Open for lunch 11:30 a.m. to 2:30 p.m., open for dinner 5 p.m. to 9:30 p.m. Closed Mondays. Value for money: $5.80 sashimi plate. The Sushi Bar on Street 302 in BKK1 is the first Phnom Penh launch of this Vietnamese chain. It may not have the best sushi in town, but it offers the best value-for-money sushi in Phnom Penh. The menu features a huge selection of sushi, from sashimi to hand rolls to nigiri. They’ve got a great nigiri plate that features 9 pieces of sushi for $5.80. The quality is about what you’d expect from a sushi chain back home; this is not artisanal hand-crafted food, but it’s still pretty damn good. They’ve got bigger sushi platters with 16 pieces for up to $18. But don’t be fooled into thinking that the Sushi Bar offers only sushi. They’ve got lots of donburis, or rice bowls, bento boxes, tempura, and katsu-type dishes. The restaurant itself offers chain-style ambiance of the fancier sort and is upscale by Phnom Penh standards. They’ve got seating at the sushi bar downstairs and booths upstairs. We prefer the upstairs, which offers booths and slightly more privacy than the open seating on the ground floor. Poki Poke in Phnom Penh explains itself by appending “a sushi restaurant” to its name, but that’s just to try and make the unfamiliar a little less frightening to Cambodia denizens. Poke is a dish of Japanese and Hawaiian roots that consists of raw fish, soy sauce, seaweed, and chili, as well as various other optional toppings. Poki Poke serves poke bowls, poke over rice, which they bill as “sushi in a bowl.” A poke bowl at Poki Poke costs just $2.50, or $3.50 for a large. 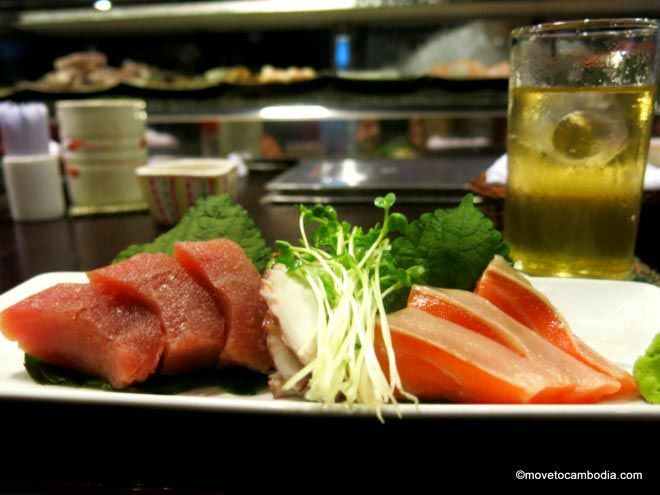 Considering what you get — salmon or tuna sashimi — the restaurant offers excellent value for money. Read our full review of Poki Poke restaurant. This decidedly-not-hip Korean restaurant seems out of place on trendy Streets 29 and 308. The menu is traditional Korean fare, with (relatively) inexpensive soups and stews, braised meats and seafood, and pricier meat menu that can be grilled at the table. But the highlight is what’s not on the menu — Korean fried chicken and beer, a combination that is all the rage in Korea and served and specialty restaurants called “hofs.” At Sura you can get an entire chicken that will satisfy several people for $15. The fried chicken comes in four styles: original, spicy, soy sauce, and garlic. Served with a side of sweet marinated radish to cut through the spice, the spicy fried chicken is deliciously fiery. Pitchers of Angkor beer make the perfect accompaniment for $3. Delicious, delicious carnitas tacos at Mexicano. Housed in an unassuming shophouse on Street 288, Mexicano, a new BKK1 restaurant, is taking Phnom Penh Mexican food to the next level. Headed by Mario Galan Ibarra, a chef who originally hails from Puerto Vallarta, Mexico, the restaurant serves refreshingly authentic Mexican fare, prepared by Ibarra himself. The tacos are served on home-made corn tortillas with simple toppings, just the way it’s supposed to be. 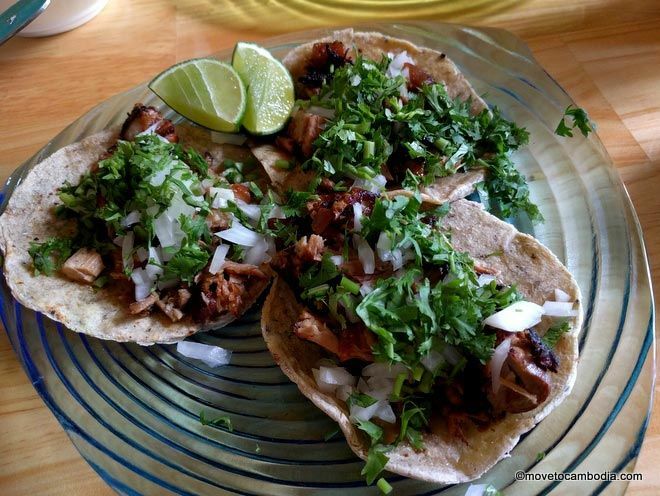 The carnitas is sensational: slow-cooked fatty pork, finished by crisping the edges so it has the traditional soft yet slightly crunchy texture. The al pastor is just as good — pork marinated with dried chili, spices, achiote, and pineapple juice. Read our full review of Mexicano. Open Mondays 6 to 11 p.m. and Tuesday through Sunday 12 to 2:30 p.m. and 6 to 11 p.m.
I.R.F. Restaurant, also called ‘Taste of the Middle East’ is a small, family-run restaurant that serves up home-style Iraqi cuisine. With the matriarch of the family in the kitchen and her teenage sons acting as waiters, it’s easy to feel like you’re getting a real Iraqi home-cooked meal! Middle Eastern favorites including falafel, shawarma, and kebabs, but also lesser-known Iraqi specialities. Maqluba is rice and eggplant casserole with lamb or chicken baked and served upside-down. Kofta are meatballs, here served in two variations, one in a thick yogurt sauce, another cooked with tomatoes. Both are delicious, and like everything at I.R.F., are relatively inexpensive — most dishes are priced between $3 and $7. Flatbread and dips, including baba ghanoush and hummus are a nice addition to the meal. Finish it off with a delicate middle eastern dessert, dripping with honey and chopped pistachio nuts.